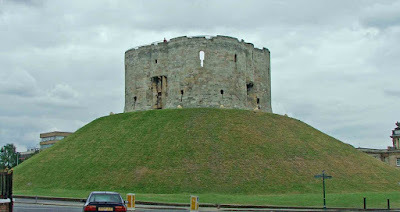 Clifford's tower is perhaps the most visible and most recognisable symbol of York's military history. The tower was built in 1068 by William the conqueror, the first of two motte and bailey structures. The second, The Old Baile, was built a year later. 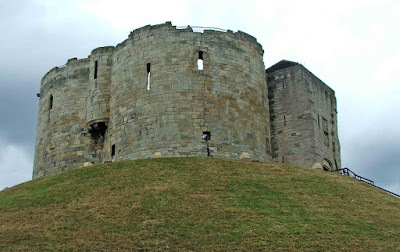 The building of both castles resulted in the destruction of one of the seven shires into which York was divided. Cliffords tower sits on the East banks of the River Ouse. Both castles would have been significant defencive structures for their day....until they were destroyed by English and Danish armies in September 1069....literally dismantled by the invading Danes under Swein of Denmark (nephew of King Cnut) The Danish invasion and sacking of York briefly gave the English a hope of evicting William the Conqueror's occupying army. However, William paid the Danish army to leave and quickly re-established his control over the city. The resulting 'Harrying of the North' saw huge swathes of the countryside obliterated of all signs of life, partly in revenge and partly military strategy. By the end of the year, both castles had been rebuilt. In 1190, the keep of the motte was severely damaged by fire in the anti-Jewish riots that took place in the city. Once again, the castle was re-built, this time on a higher motte. In both these periods (pre and post fire) the castle was built in wood....a state of play that remained unchanged until the 13th century. During 1902\03, archaeological digs on the motte discovered a layer of charred material, probably relating to the fire of 1190....this material laying some thirteen feet below the summit of the motte, demonstrating the rebuilding that took place after the devastating fire. The castle was surrounded on three sides by the Rivers Foss and Ouse, helping to provide the fortification with enhanced protection. In 1228 disaster struck again, when the wooden castle was blown down in a gale. No rebuilding work was done for 17 years, until Henry III gave instructions for the castle to be rebuilt in wood and stone. By 1270, the castle was once again complete. Two of Henry III's chief castle builders were employed to make sure that the castle was built to its maximum strength: Henry de Reyns, Henry's master stone mason, and Simon of Northampton, Henry's master carpenter.....both of whom had worked on Windsor Castle. Over the next twenty or so years, over £2500 was spent on improvements. It is thought that the quatrefoil design for the tower was taken from Henry de Reyns tower at the Chateau de'Etamps, some thirty miles South of Paris. Each lobe of the tower possessed two arrow slits, allowing those occupying the castle to keep watch in all directions. Significant repairs were required after flooding in 1315 and 1316, and yet more in 1360 when part of the motte collapsed causing cracks to appear in the tower's walls. Some £200 was spent during this period, on repairs, and some of the repaired cracks are still visible today. The castle was largely untouched until the 1660's, most likely due to the diminishing threat from North of the border. From the early 1500's, the castle became more of an administrative centre than a military stronghold, and it was allowed to fall into a state of disrepair. In 1596, the city gaoler, Robert Redhead was responsible for removing large amounts of roofing material from the castle, and it wasn't until the city council brought the theft to the attention of the crown, that he was stopped. The 1600's saw a period of building in the bailey region of the castle, and the keep on the motte transformed into a gaol. The tower was by this time, demoted from a defensive structure in this respect, and the castle promoted to the centre of civil administration for the city. In 1614 the tower was leased out by James I so that he didn't have to pay for the many repairs that the castle required, but at the outbreak of the civil war it was home to a Royalist garrison. In 1643 the upper floors and the roof were strengthened to enable a number of cannons to be stationed there. 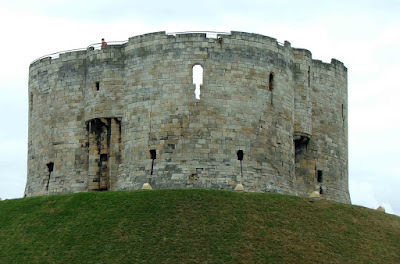 During the siege of York in 1644, the tower came under fire from Parliamentarian cannon, suffering some minor damage. It was repaired in 1652, and continued to be garrisoned under Charles II. In 1684, a fire spread to the gun powder store in the tower, causing a huge explosion. Much of the wood of the tower was destroyed, and the walls were seriously damaged. Minor repairs were made, and it was garrisoned right up until 1688, when it eventually passed into private hands. As soon as it became a privately owned structure, it lost all military use, and became a 'garden feature' with a spiraling footpath from the foot of the motte to the summit. The tower, including the castle's building beyond the motte, remained standing through the 1700's, largley unchanged. It wasn't until the 1820's that prison reformers began to demand that the prison conditions at York gaol be improved, and in 1824, a decision was made to enlarge the prison, and provide larger cells, with more security. 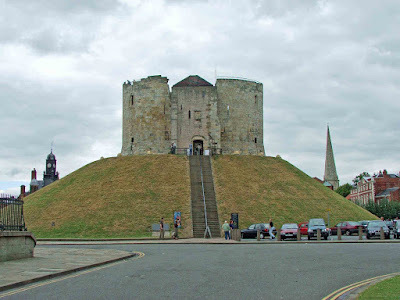 Land adjoining the castle was purchased for this purpose, and for a short time it looked likely that the tower and the motte upon which it stood was in danger of vanishing for ever. The tower survived though, even though the motte was revetted with a huge wall right around its base. The new prison was built, and the tower was spared....however, other parts of the castle vanished: the gatehouse, most of the curtain wall and most of the buildings within the walls. In 1900 the castle was no longer a public prison, but had been turned over to the military for their use. It remained under their control until about 1929, after which most of the prison buildings were dismantled, except for the debtor's and women's prison which now house the museum. The revetment around the base of the motte has long since gone, and the motte has been restored and strengthened, and the the tower is now open as a tourist attraction.